Put down the bong. There are better ways to get high. But instead of racing around the world scaling the highest peaks on Earth, book a flight to these five capital cities where you can enjoy the views without all the extraneous huff and puff. And unlike a journey to some remote cliffside town made up of nothing more than a few scattered buildings, there’s plenty to see and do in these cultural hubs that just so happen to double as scenic mountain paradises. While the formerly hermetic Buddhist kingdom of Bhutan has opened up quite a bit to travelers and outside influence in recent years (finally allowing TV and internet in 1999), it remains one of the world’s best-preserved nations both culturally and ecologically. 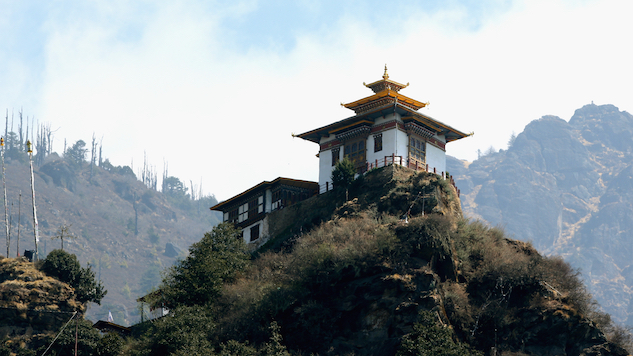 Recent developments have brought a few more bells and whistles to its small capital city of Thimpu (pictured at top) like a new national stadium and riverside park, but the main draw here continues to be the city’s wealth of ancient monastic complexes, its laid-back spiritual lifestyle and the pristine nature that surrounds the city. In Thimpu there are bookstores, nightclubs and pool halls, but trekking the surrounding mountains is clearly the best way to spend the day in the nation that invented the term “Gross National Happiness.” A side trip to the stunning Paro Taktsang (or “Tiger’s Nest”) monastery, which was carved into a 4,000-foot cliff on the side of a mountain in 1692, will take your breath away. Literally. If you stacked the Mile High City of Denver on top of itself, it still wouldn’t be as high as this sprawling Bolivian city that serves as one of two Bolivian capitals (the other being Sucre). The beautiful colonial city, established in 1548, offers a terrific way to see the sights via the world’s highest gondola ride (or “teleferico”) that offers a safe and modern alternative to traffic-clogged streets. Another way to take in the awesome views is by posting up at one of several scenic overlooks (or “miradores”) strategically located around the city or hacking it up at La Paz Golf Club—which, at just shy of 11,000 feet, offers a thrilling round as the world’s second highest golf course. Another must-do is taking in some traditional Andean folk music at one of the local music clubs (known as “penas”), as is a side trip to the world-renowned (and yes, quite humorously named) peaceful mountain oasis of Lake Titicaca. Ecuador’s capital city boats one of the most beautiful and best-preserved historic centers in all of the Americas, with more than 40 churches, 17 plazas, and 16 convents and monasteries glistening in a stunning old city tailor-made for strolling. Once in town, you can eat in a Mercado (big local market), drink pitchers of “vino caliente” (hot wine) like a local or ride the world’s second highest cable car system to take in expansive views marked by the active Pichincha Volcano that dominates the landscape. Yet in a city surrounded by nature, you’ll want to get out and explore nearby areas like the hot springs of Papallacta, the indigenous market of Otavalo and the subtropical cloud forests of Mindo. The city also makes an excellent base for exploring the Galapagos Islands, something every traveler to Ecuador is pretty much required to do. There’s always something happening in Bogota. This massive city of nearly nine million is sort of like the Miami of South America with beautiful people, rooftop pool parties and a bumping club scene. More laidback travelers never miss exploring the historic downtown district of La Candelaria, founded in 1538 with colorful painted buildings, charming cobblestone streets and 400-year-old churches. Fun daytime activities include taking the cable car (or hiking) to the church atop the 10,400-foot mountain Monserrate, taking a “graffiti tour” through local neighborhoods or catching a manic football game at Estadio El Campin. By the time you’re done drinking yards of beer (or “jirafas”) at Bogota Beer Company or clubbing at La Villa, you’ll be ready for a relaxing trip to the beautiful spiritual lake of Laguna de Guatavita or a chill day people-watching with locals in the city’s Simon Bolivar Park. The capital of Ethiopia is not exactly what first springs to mind when you think of your typical mountain town, but it is nevertheless a bustling high-elevation city with great food that is quietly growing more popular with adventurous travelers in recent years (so much so that even Anthony Bourdain visited recently during an episode of Parts Unknown). Like many such mountain towns, the best way to see the city is to scale its highest peak, in this case the 10,500-foot Mount Entoto. While you will experience a taste of rural village life along the trek to the mountain, the city itself is a modern conglomerate of coffee shops, hookah lounges and bars/clubs, not to mention a booming tech/IT scene and efficient light rail system. With many international missions and embassies, the city is a hub of African diplomacy and many such palaces, government buildings and cathedrals can be seen on a stroll through the downtown. Cultural/culinary walking tours such as Addis Eats are also popular and haggling at Addis Mercato, Africa’s largest outdoor market, is quite possibly the quintessential local experience.